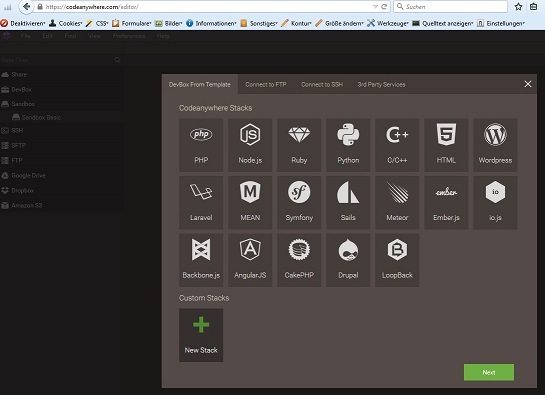 How To Set Up a Node.js Express App on a CodeAnywhere Ubuntu 14.04 DevBox – Mabuhay! This tutorial will cover setting up a production-ready simple web application in Node.js using Express framework and Nginx web server as a reverse proxy that also can handle caching. With „pm2“ we will keep the application alive. 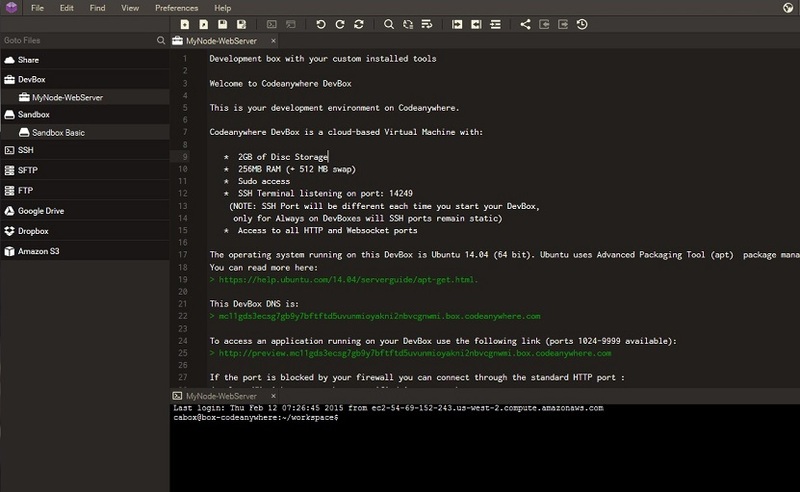 We do that all on a Ubuntu 14.04 Dev Box using „CodeAnywhere.com“ as our working environment. You can use this same tutorial on any other hoster with Ubuntu as well. 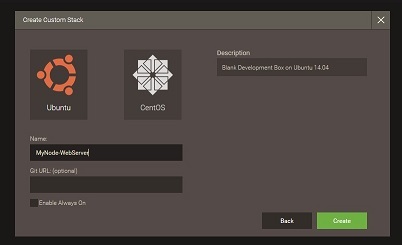 For other Linux distributions, the setup may vary when it comes down to how to install prebundeled software packages. nginx – A HTTP and reverse proxy server for serving static files, load balancing, and caching. It puts its focus on high concurrency, performance and low memory usage. Client requests to a page of our application will be passed by Nginx to Express. Express returns this page to Nginx, which then is sent back to the client. pm2 is used to monitor our Express application to ensure that it is running, and restarts it if stopped. The Express framework is built on Node.js, therefore we must first install Node. Ubuntu 14.04 comes with a node.js 0.10 (due to name conflicts it is called „nodejs“ on the package management). 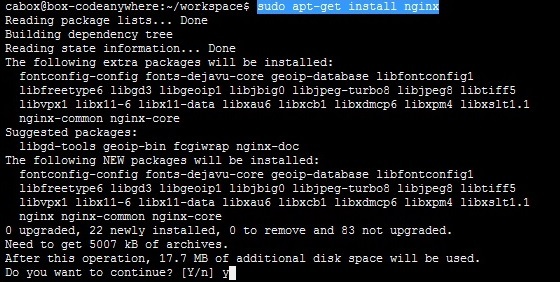 You can either install this version using the package manager with „apt-get install nodejs“ or follow the steps to install the newer version of nodeversion 0.12. This instructions are according to „nodesource.com„. To test the Node.js is properly working, we will create a Hello World application that simply returns „Hello World“ to any HTTP requests. This sample Node.js application will only listen on the specified IP address and port (127.0.0.1:8080). When requested, it returns „Hello World“ with a proper 200 HTTP status code. This means that our application is only able to be accessed from the same server locally – from localhost only. Running a Node.js application this way will block additional commands until you kill it by pressing CTRL+C. If you can see the output „Hello World“, the application (and Node.js) is working properly. Be sure to kill the application (in your other terminal session) by pressing CTRL+C if you haven’t already. 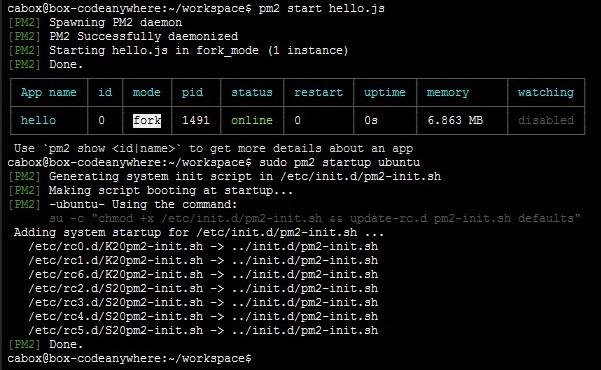 We install pm2, which is a process manager for Node.js applications. With pm2 we can easily run our applications as a service. This will add our application to the pm2 process list and outputs a short overview of the process‘ details. pm2 has a couple other commands to start, stop, restart, monit, … helpful to manage our applications as background services. Our application hello.js is now running and listening on our private IP address. To make it available for users to access it from the browser, we will set up an nginx web server as a reverse proxy. This will configure the webserver to respond to requests on port 80 at its URL root „/“. Accessing „http://example.com/“ (substitute your own domain name) in a web browser would send the request to nginx which will proxy the request to our Node.js application locally on port 8080 and respond back to the user. You can now try to access your web servers URL in a web browser to test your application. Assuming that your Node.js is running and your nginx configurations are correct. So far, so good. 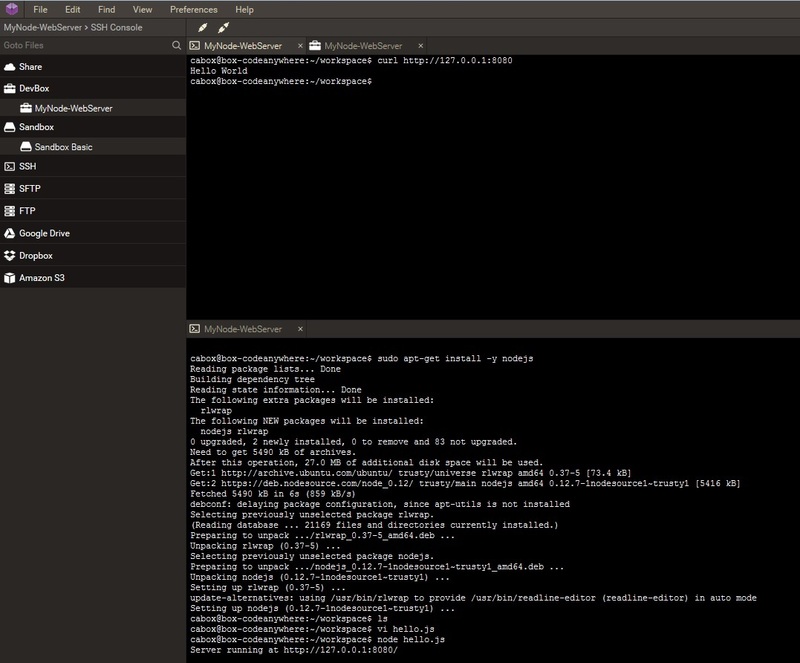 We now have a running Node.js application served with nginx as our reverse proxy server. 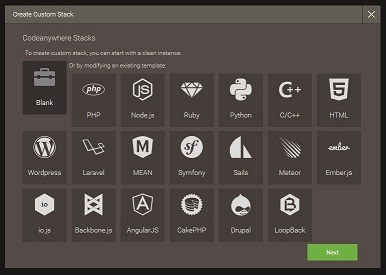 In the next steps, we will install Express – a Node.js application framework. Express provides us with a application generator tool, to quickly create an application skeleton. Now we have installed it, and can use the command express [appname] to generate a application skeleton. This will create an Express app in our current working directory. Testing your new Express application with curl and you should see a sample page with the text „Express / Welcome to Express“ on it. (You need a second terminal session again). Note: By default, the Express application uses a port 3000 – you can change that later if you like. To have this new application running as a service, like we did before, stop it now and start it again just this time we use pm2. If you haven’t already, kill the application by pressing CTRL+C. Then use pm2 to start it in the background. Like with the simply plain Node.js application hello.js, which we create earlier in this tutorial, also our new Express application isnt yet accessible by users in the web browser. We have to configure our new application in nginx to finish this last part. 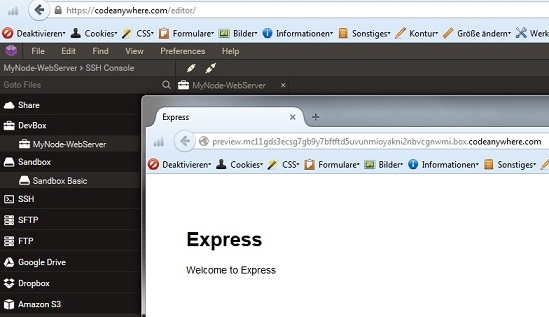 Now you should be able to access your Express application with your web browser via http://example.com/. You should see the text „Express / Welcome to Express“ slightly styled with basic CSS. Is used a few other tutorials to learn it myself and to combine them here.